Vernier grew up in Croatia and went to college at KIF Zagreb. She played professionally indoors in Croatia and Austria, winning two Croatian championships and two national cups. She also played European cups for Croatian and Austrian clubs. 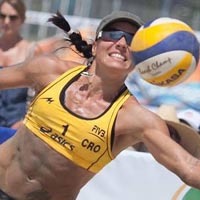 Varnier started playing beach volleyball in California in 2009.